Strong research skills (at least one year, wet and dry lab experience preferred), excellent academic performance and research interests aligned with our faculty make strong candidates. The Master of Science program requires 26 credits. This coursework can generally be completed within the first year. Will I receive financial support as a Master of Science student? Master of Science students do not receive financial support from the department, but are welcome to apply for financial aid or seek other funding. All students are responsible for minimal quarterly fees. I want to work with a specific lab/professor. How do I get a position in a lab and do I contact the professor directly? To get a position in a lab, you must first first be admitted. Although you are encouraged to learn more about our faculty and are welcome to contact them directly, please note that lab space will not be guaranteed unless you receive a formal offer from the Department’s Admissions Committee. If you are an International student, please contact the International Student Services Office. Can I apply for a Research Assistantship (RA) or Teaching Assistantship (TA) position as a Master of Science applicant? Master of Science students are 100% responsible for paying for their tuition and benefits. M.S. 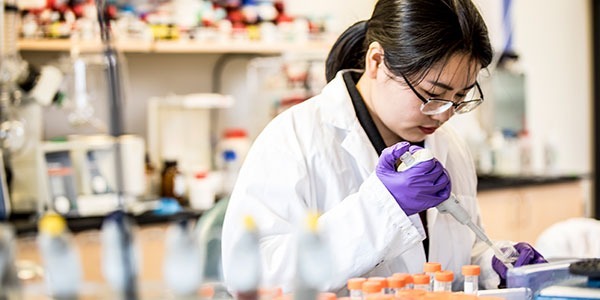 students are welcome to apply for TA and RA positions in Bioengineering and other departments; however, these appointments are extremely competitive and Ph.D. students often have priority. Search for RA and TA positions on campus using UWHires, category Academic Student Employee. International candidates, please visit the Graduate School’s Frequently Asked Questions page. Master of Science applications are due December 4, 2018, 11:59 p.m. Pacific Time, USA for Autumn 2019 admission. Do I need to have a BS in bioengineering to apply to your program? No. We actively seek individuals with degrees in bioengineering, chemical engineering, chemistry, physics, biology, computer science, electrical engineering and related disciplines. We select the best applicants from a wide array of backgrounds. I do not have an engineering, mathematics, or science background as you mentioned above. Can I still get into your program? We do not have a minimum score requirement. The averages for our 2018 Master of Science cohort were: GPA: 3.53(on a 4.0 scale); GRE (percentiles) Quantitative: 87; Verbal: 76; and Analytical: 59. The only way the GRE requirement can be waived is if you have previously earned a Ph.D. Please refer the application checklist on our Master of Science Admissions page. Do I need to send paper copies of my GRE and/or TOEFL? My application to the Ph.D. program has been denied. Can I apply and be reconsidered for the M.S. program? If you are denied admission to the Ph.D. program and wish to be considered for the M.S. program, you must email bioeng@uw.edu to inform the Graduate Academic Counselor. Do not apply to the M.S. program. Has UW Bioengineering received my official GRE, English language proficiency exam score, and/or letters of recommendation? To check the status of these documents, please log back into your application prior to contacting us. Does UW Bioengineering require the GRE subject test? What transcripts should I submit with my application? You must upload unofficial transcripts directly into your application by the deadline. An unofficial transcript is any transcript that you have received or have uploaded from your former institution. Do I have to include community college transcripts in my application if my courses transferred to my undergraduate or former graduate institution? No, if the transferred courses AND their GPAs and credit information are recorded on another institution’s unofficial transcript. However, if one or more of these criteria are missing the other transcript(s), then you will need to submit the community college transcript(s). Official transcripts are only required after you receive an admission offer. After the offer is made, you will receive instructions for submitting your official transcripts. Do letters of recommendation have to be submitted by the deadline? Yes, letters of recommendation are required to be submitted by the deadline. No late or incomplete applications will be considered. (International Applicants) Do I have to complete the Financial Availability Form? Please do not submit this request until you have received an offer and decided that you will be attending the University of Washington. Application fee waivers are available for McNair fellows and Posse scholar, and to students who indicate financial need and have filed a FAFSA. To apply for the application fee waiver, please submit your application no less than 1 week prior to the deadline, as fee waivers take several days to process. Toward the end of the application, there is a drop down option (or a box you can select) where you can select an “apply for application fee waiver” option. UW starts sending out notifications to Master of Science applicants via email and/or through the online application profile to students by the end of March. Can I work with affiliate faculty if I’m accepted into the Department of Bioengineering? No. Students’ primary advisers must be core or adjunct faculty. Once you secure a primary adviser, it is possible for you to be co-advised by an affiliate faculty member. Can Emeritus/retired faculty or faculty lecturers mentor graduate students? Any faculty are welcome to mentor our graduate students; however, only core or adjunct faculty may serve as a student’s adviser.